It’s an unfortunate fact of real estate that some rooms are smaller than you’d like. Whether you’re selling your home because it’s simply too cramped for your current needs, or you have to make the most of a particularly miniscule closet or bathroom, there are plenty of reasons to stage a room to look larger. If you’re figuring out how to get your house ready to sell, it’s important to show the entire home to its best advantage – even the parts that are less than ideal. Before you throw your hands up in despair over your more modest spaces, try these tips! Use light colors – If you’re planning to repaint your home in a neutral hue anyway, select a lighter, brighter color for smaller spaces. Off-white or an especially light gray can help cramped spaces seem larger. Add a mirror – A strategically placed mirror can reflect additional light or make a space seem deeper. Just make sure you like the view reflected in the mirror, or else the addition may wind up subtracting from your home’s appeal. And a bonus: If you stage your home with a mirror, you can take it with you to use in your new space! Open the curtains – Adding natural light to any space generally makes it seem larger. If the room has curtains, make sure you throw them wide open before showings! Consider your window treatments – On the subject of windows, you may wish to rethink your curtains. Minimalist options like blinds or even going curtain-free can help a space seem larger. If you absolutely must have curtains, think about rehanging them higher and wider to make windows seem much larger. Incorporate additional lighting – Finding ways to amplify the lighting in small spaces is crucial. Install extra-bright lightbulbs, find a new lamp for the room, or even swap out the lighting fixture to ensure that your small room feels bright. Reduce clutter – When it comes to decorating a small room to sell your house, nothing makes a bigger impact than reducing clutter. Paring down collections and other items in the space will help it feel larger. Display items thoughtfully – Any items you opt to keep in the room should be displayed with care. A great rule of thumb is to leave ⅓ of the space on any shelves, cabinets, and hanging rods free. Staging any room in your home can help it feel more pulled together and more appealing to potential buyers. 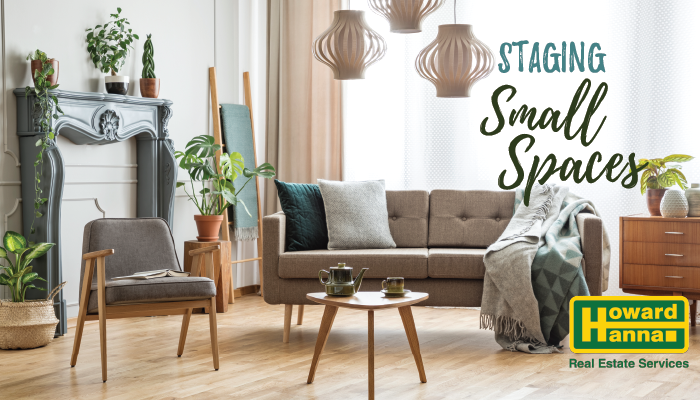 Giving your home’s smallest spaces some additional TLC (and a little staging magic!) can reap rewards.